Do you pay attention to the Nutrition Facts label when you buy food? You should. It’s not perfect, but it is an excellent resource for ensuring your body gets the right nutrients in the right amounts. The Nutrition Facts label should be one of the first things you check whenever you shop for food. The Nutrition Facts label, also called the Nutrition Facts panel, provides information to consumers about the serving size, number of servings, calories, and nutrients of a particular food. These labels are organized into several distinct sections—serving size and calories, nutrients, and a footnote. A list of ingredients is usually under or near the Nutrition Facts label, but is not technically part of the label itself. This nutrition information in the nutrition label is required by law for most packaged food products in the United States. Many other countries require something similar with slight variations in format. At first glance, the Nutrition Facts label may seem like a confusing jumble of numbers and nutrients. It can be more easily understood when you break the information down by section. Once you understand this label and the information it contains, you can make well-informed dietary decisions to improve your health through better nutrition. You can find serving size and calorie information at the top of the nutrition label. Servings are presented in easy to understand units, like cups or pieces. The size of each serving is standardized by the FDA to make it easier to compare similar foods. Pay extra attention to the serving size. This is often one of the most overlooked items on food labels. An official serving may be smaller that you think. A “serving” is different from a “portion.” A serving is a measured amount of food. A portion is the amount you decide to actually eat for a meal or snack. One portion may actually be multiple servings. If you eat an entire package of food in one sitting, you may actually consume two or three servings. Or more! Do you know how many servings are in a large bag of potato chips? Understanding serving sizes will help you decide how much you should eat. As I write this, I just happen to have a half-eaten bag of Cacao Goji Power Snacks on my desk, so I’m going to use that as an example. Based on the above label, one serving of the goji snacks equals about three pieces. If you eat half of the bag in one sitting, about 12 pieces, you quadruple the number of calories and other nutrients shown on the label. A calorie is a measurement of energy. Scientifically speaking, a calorie is the amount of energy required to raise the temperature of one gram of water by one degree. A kilocalorie, or 1000 calories, is the energy needed to heat a liter of water by one degree. Because English is kind of an imprecise language, what we call a calorie when we refer to food is actually a kilocalorie, or kcal. For simplicity’s sake, and because of common usage, we are also just going to call them calories for the rest of this article. This section helps you determine how many calories you consume in each serving. The serving size in our goji snack example is three cubes, which is about 120 calories. If you consume 12 pieces (four servings) in one sitting, you’ll actually consume 480 calories. Why do calories matter? They are directly correlated with weight management. Your body stores the energy it can’t use immediately. Consuming excessive calories can lead to weight gain, diabetes, and other serious health complications. However, you also don’t want to consume too few calories each day. The calories you eat fuel your body, and a machine with no fuel can’t function. Knowing the number of calories is important, but it’s not enough. You also need to be aware of where the calories come from. Not all calories are created equal. Empty calories, like those you get from refined sugar, do nothing for your health. Calories from complex carbs and proteins provide lasting energy and help build and maintain muscle. 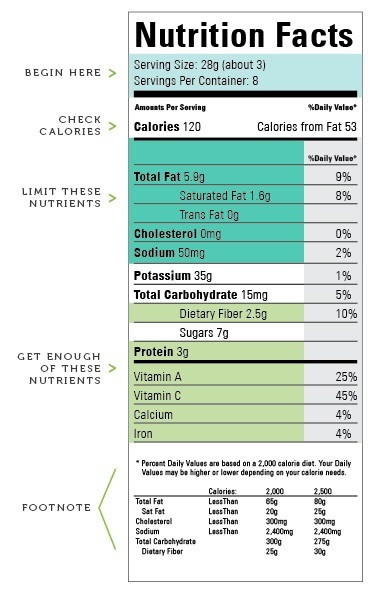 Just below the calorie information is the largest part of the nutrition label—the nutrients section. The nutrients section includes fats, protein, vitamins and minerals, fiber, and carbohydrates. These nutrients are split between two categories. I’d like to clarify that these nutrients are not necessarily bad in and of themselves. Humans even need a certain amount of fat and sodium to survive. Their inclusion here just means that most Americans get enough or way too much of these nutrients. The typical carnivorous American diet is generally protein-heavy. The second part of the nutrients section details the beneficial nutrients—dietary fiber, vitamins A and C, calcium, iron, and others. These vitamins and minerals provide a variety of specialized healthful benefits. For example, vitamin A is a powerful antioxidant and is critical for vision and skin health. Eating foods high in fiber is a great way to regulate your digestive tract. Consider the nutritional content per calorie. The more health-promoting nutrients per calorie, the better. A great measure of food is to think in ratios of nutrients to calories to make healthier decisions. Just as you can use the Nutrition Facts label to limit your intake of fat, sugar, and sodium, you can use it to increase your intake of beneficial nutrients. Nutrient content is measured by two numbers. The first is the actual amount of the nutrient per serving by weight, usually represented in grams or milligrams. This information isn’t particularly helpful unless you know exactly how many grams or milligrams of a particular nutrient you need each day. That’s why the second number shows the percentage of daily value. The percentage of daily value tells you how much of your daily requirement of each nutrient is provided by one serving of that food. What Does the Footnote On the Nutrition Facts Label Mean? The final section of the Nutrition Facts label is the footnote. The footnote explains the percentage daily values of different nutrients. Did you notice that asterisk up by the percentage daily value at the top of the nutrients section? The first part of the footnote is the continuation of that asterisk. It says, “Percent Daily Values are based on a 2,000 calorie diet. Your daily values may be higher or lower depending on your calorie needs.” This statement is required on all food labels, and it’s very important. People are different and have different nutritional needs. Age, gender, and activity level all affect how much you should consume. A 2,000 calorie diet may not be the best for every individual based on needs and dietary goals. Someone trying to lose weight has different nutritional requirements than someone trying to gain weight. A large person will generally need more calories to maintain the same weight than a smaller person. A person with a physically active job, like a lumberjack, needs more calories than someone who works a sedentary office job. Always consult your healthcare provider to establish the best diet for your individual needs and goals. The second part of the footnote is not required. Manufacturers generally omit it if there’s no space on the label. This part gives the recommended daily values of certain nutrients based on 2,000 and 2,500 calorie diets. When present, this part is always the same. It doesn’t change from product to product. 65 grams of total fat is 100% of your Daily Value. So you should limit yourself to 65g, or less, total fat per day. For dietary fiber, 25g is the absolute minimum requirement. In 1990, the United States Food and Drug Administration (FDA) passed the regulations that led to the Nutrition Facts label. For the next 26 years, the label didn’t change much. 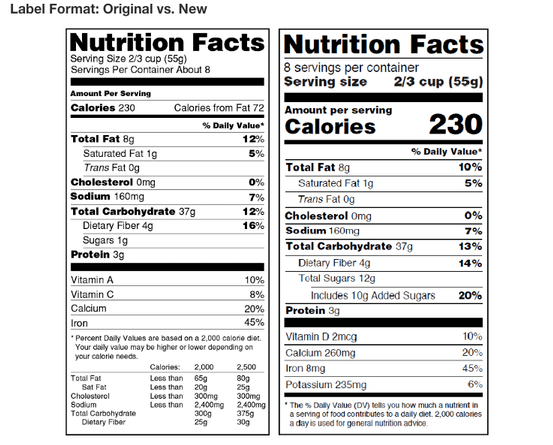 On May 20th, 2016, the FDA updated some of the requirements for the label to reflect our better understanding of nutritional science.Here are some of the changes. The font size for “Calories,” “Serving per container,” and “Serving Size,” was increased to make the information more readable and attention getting. Food manufacturers must show the amount of nutrient by weight in addition to the daily value percentage. The label will now include “added sugars.” Until this change, nutrition labels grouped added sugars and natural sugars together. Vitamin D and potassium are now required to be listed on the label. Calcium and iron will continue to be required. Other vitamins and minerals can be declared on a voluntary basis. “Total Fat,” “Saturated Fat,” and “Trans Fat” will remain on the label, but “Calories from Fat” will be removed. Research shows that fat type is more important than fat calories. Daily values for nutrients like sodium, dietary fiber, and vitamin D are being updated based on new scientific evidence. Serving sizes will be revised to reflect how much people actually eat. Packaged food items that are intended to be consumed by one person in one sitting must be listed as one serving. For example, manufacturers can no longer get away with claiming one 20 oz bottle of soda contains two servings. For food items that are larger than a single serving, but should not be eaten in one sitting, manufacturers are required to provide a dual column label that lists nutritional information on both a “per serving” and “per package” basis. When most people hear the word “diet” they think about restrictive dieting programs with the goal of achieving a certain outcome, typically weight loss. Instead, think of a diet as gradual small changes that steadily improve your nutrition. In other words, a diet is not a short-term program where you can lose 20 pounds and forget about it. A healthy diet should be a lifestyle change, consisting of hundreds of small decisions and smart choices. Knowledge is power. The more you know about nutrition, the better able you are to make intelligent decisions. If you decide to eat something that is not healthy, restrict yourself to a small serving. Consuming the right foods in the right amounts is the key to good nutrition and good health. A raw vegan diet really is the healthiest possible nutritional lifestyle. I understand that this lifestyle isn’t for everyone, but if you can do it, do it. At Global Healing Center, wellness means providing your body with clean, essential nutrients so that it may rely on its internal cleansing and self-healing mechanisms to function at peak efficiency. Starting a healthy diet can be as simple as one small change each day or week. You can modify your current diet or implement a complete detox diet plan. Regardless of what works for you, nutrition labels can be an important tool for your journey to better health. Do you pay attention to food labels? Does it make sense? Does it help you make healthier lifestyle choices? Share your comments below.